Choose your shutter style then call us for pricing! Our Most Complete Collection of Affordable Priced Composite Wood Shutters With 40 Colors To Choose From! Beautiful outdoor shutters for the discerning homeowner. 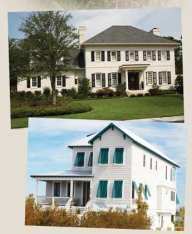 They come in Louvered, Raised Panels, Board and Batten styles. Sized to fit, made from proprietary exterior solid composite wood material, They are custom crafted with enduring, maintenance-free materials. The "Classic Composite Shutters" by Atlantic Premium shutters can be installed with operable shutter hardware for functional use. Offering Detailed styles and 40 designer colors to choose from, You will have piece of mind with these shutters backed by Atlantic's ten-year warranty on shutters and finish these shutters were formerly known as: Stonefield® Classic Shutters. The Best and Longest Lasting Fiberglass Premium Composite Shutters! Atlantic Premium Shutters look like wood, but have a Lifetime limited Warranty by Atlantic. 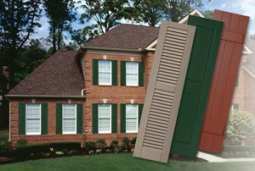 These historically accurate outdoor shutters are constructed with pultruded fiberglass, high density PVC and proprietary composite materials for strength and durability. A two-part acrylic urethane finish is applied in your choice of 40 specially formulated colors. Optional operable shutter hardware is forged from stainless steel with a matte black finish. All of these materials make Atlantic exterior window shutters the perfect choice for the outside of your home and assure your outside shutters will be maintenance-free and worry-free for years to come. Choose your style then call us for pricing or information!